What's it all about? 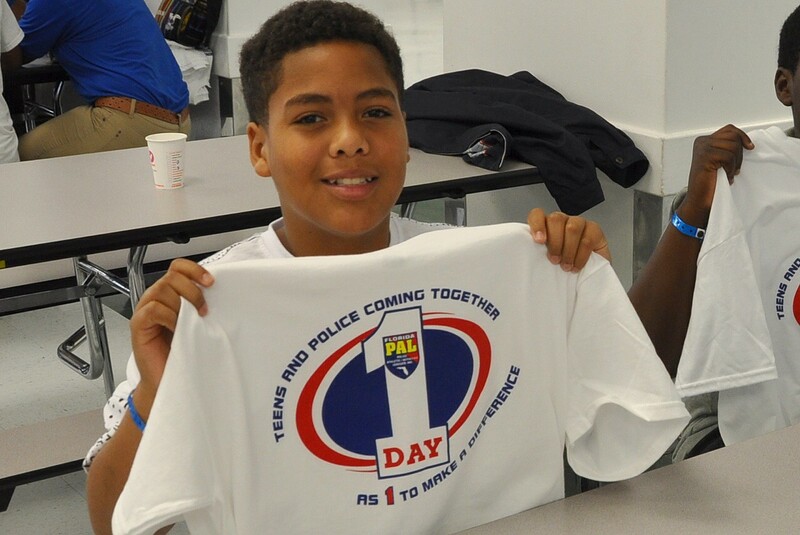 The T-shirts for the rally participants announced the theme of the 1 Day Rally: "Teens and Police Coming Together as 1 to Make a Difference. One of the foundational concepts of the Police Athletic League is - cops and kids getting along-so who better to promote a rally such as this? 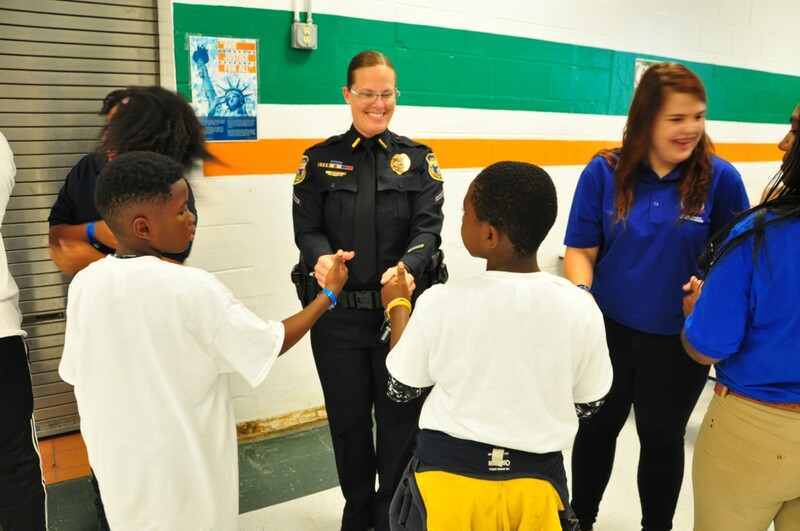 Last year, in May of 2015, Florida PAL put on a similar rally in Jacksonville at the Jacksonville Police Athletic League (PAL) facilities, with financial aid from a National PAL Mentoring Grant. Florida PAL was encouraged by the success of that rally and wanted to offer the experience again. This year, Florida PAL covered most of the expenses themselves (lodging, speakers, T-shirts), with help from St. Johns County PAL, who organized the location site, provided lunch, and arranged for a free, historic, evening trolley tour of St. Augustine for all the attendees. 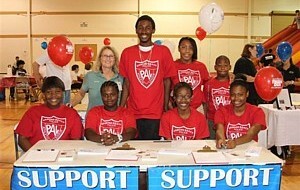 One hundred PAL kids from PAL chapters across the state of Florida attended the rally, along with twenty-six adults, mainly those adults who interact on a regular basis with the kids in their local PAL chapters. Many of the adults accompanying their kids were law enforcement officers in uniform. The attendees came from Jacksonville, Ormond Beach, Satellite Beach, Lakeland, West Melbourne, Florida City and Homestead. 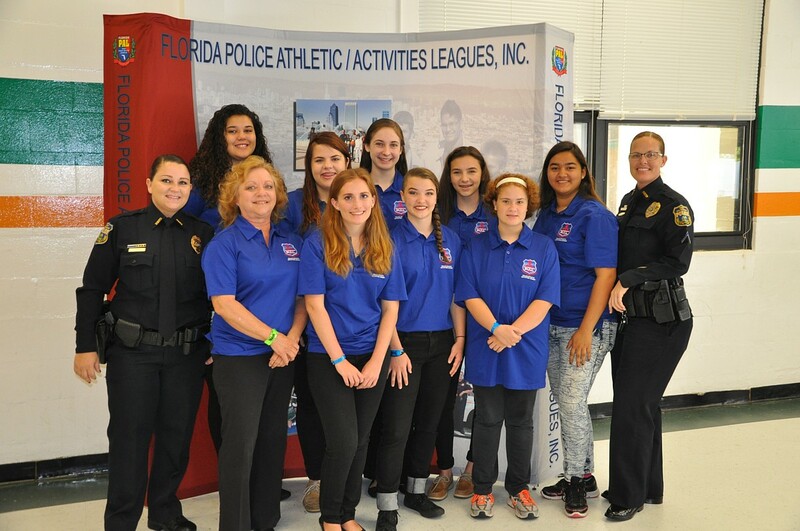 Florida PAL hosted two youth and one adult from each PAL, paying hotel expenses for those traveling more than one hundred miles. Each PAL was welcome to bring additional youth and adults at their own expense, and most did. Some of this year's participants had attended the SFAPAL/Florida PAL May 2015 1 Day Rally, but most had not. What was the point of the rally? 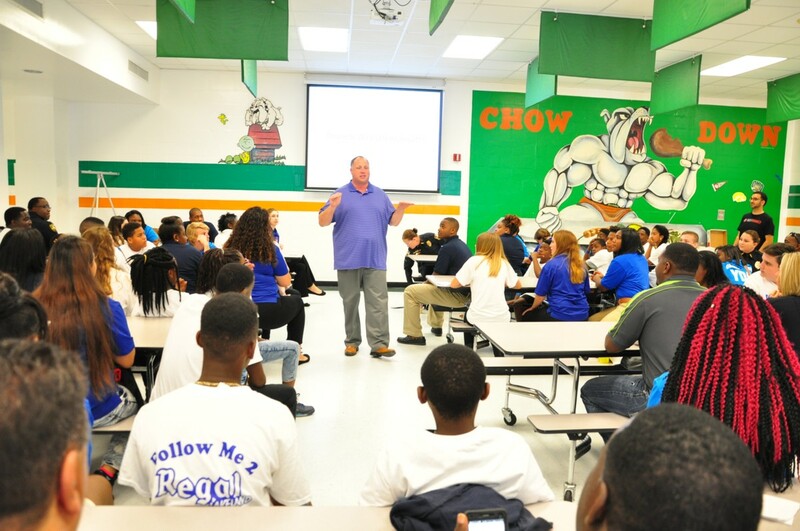 Florida PAL hoped to give youth and police a better sense of how they can interact positively. 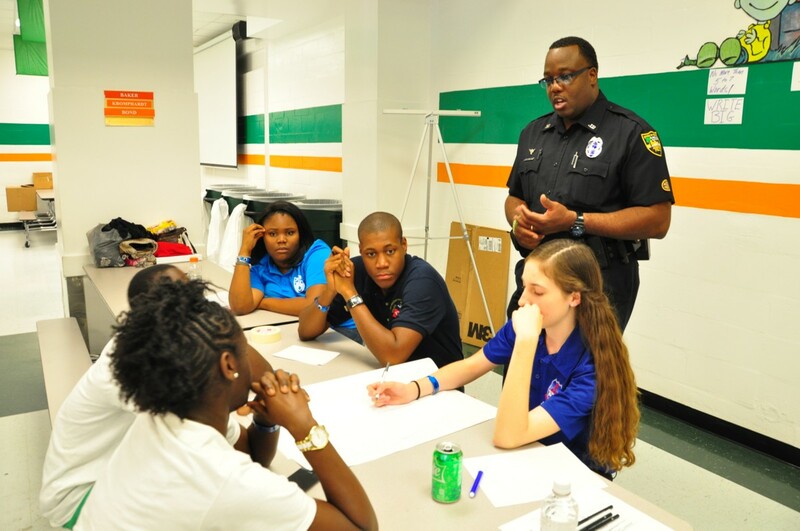 After events in Ferguson, Missouri, and other places where young people and police have had violent confrontations, the need to promote increased understanding became crucial. 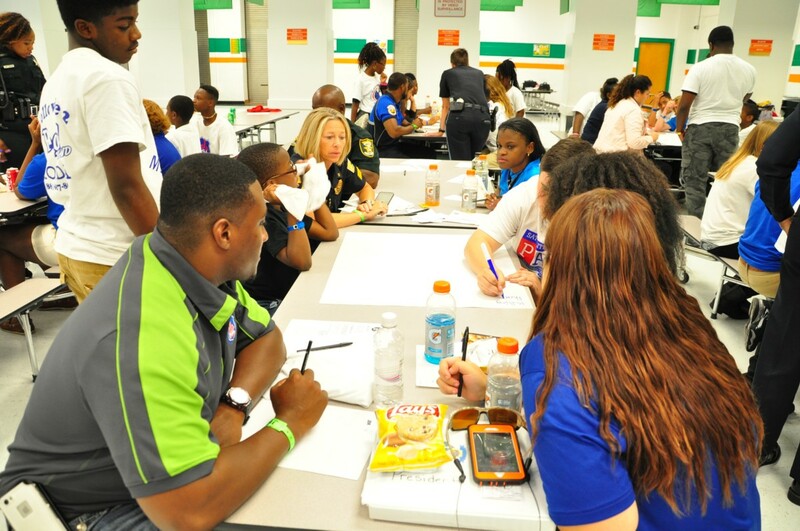 This rally offered a safe place to explore ways to improve report and positive outcomes. Instructor Javier Sanchez explains the days event and purpose. Mr. L.B. Scott, executive director of SFAPAL/Florida PAL, welcomed everyone. He introduced himself and Rhonda Scott, Florida PAL events coordinator, and thanked her for organizing the event. 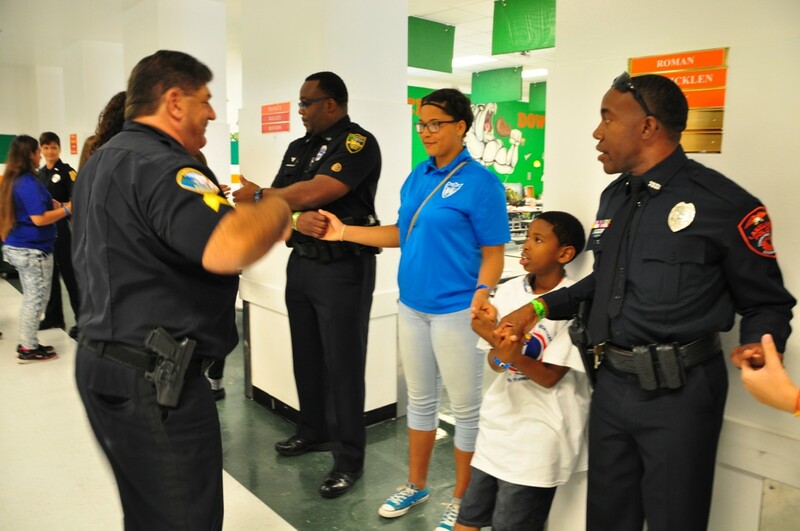 He thanked Sergeant Rob Gober, St. Johns County PAL program director, and his staff, for their help with the rally. 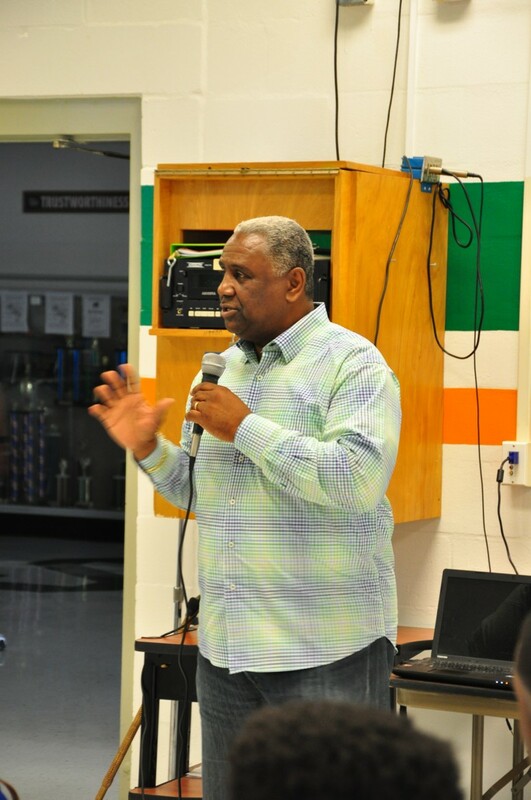 Mr. Scott recalled his connection with the site of the rally, Murray Middle School, or Murray High School, as it was in 1965 when Mr. Scott graduated from there. A banner still hangs in the gym, congratulating the Murray High School basketball team of 1963 for winning the state championship-the only team in St. Johns County to win at that level. Good memories--Mr. Scott was on that team, and his name is listed along with the others on the team! 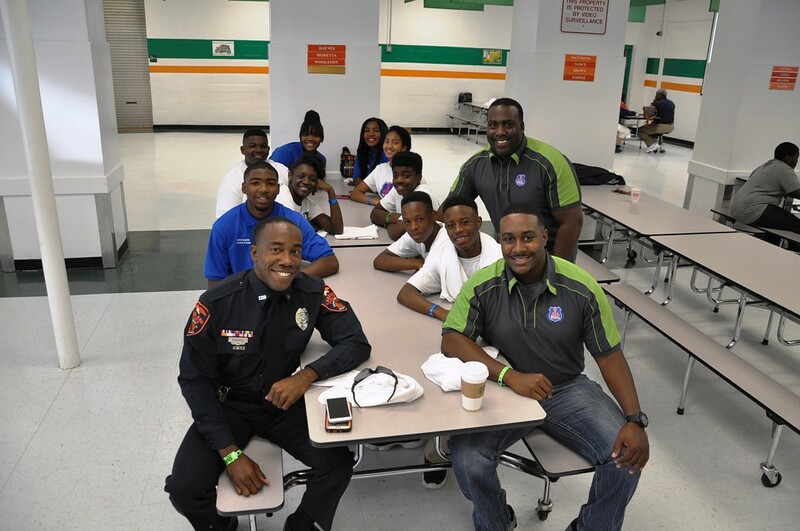 Teens and law enforcement officers forming good relationships is nothing new to Mr. Scott. From his school days there at Murray, he remembered the police officer who would stop by the school grounds on weekends when kids gathered informally to play. This officer always brought ice cream cups for everyone and became a friend to the kids. Another lasting memory! Mr. Scott welcomed Javier Sanchez, of R.E.A.C.H. Communications, and Ty Sells, of Youth to Youth, and thanked them for serving as rally facilitators. Lakeland PAL is all smiles and poised to take part in the experience. "You are the 'We have had enough generation,'" Javier said, addressing the teens in the audience. "You have had enough of what's going wrong and you want to fix it. The future is in your hands. After today, you'll know what it means to be a 'way-maker' and feel inspired to make a way for yourselves and others to be successful." Be present. Your phones take you somewhere else. Be open to this opportunity. We will play some games that might make you uncomfortable, but use that as an opportunity to grow. Be opportunistic. You have the opportunity today that thousands of young people don't have-you are here. Take advantage of it. Be prepared for impact. The rally is called "1 Day," but it's also about every day after this, too. 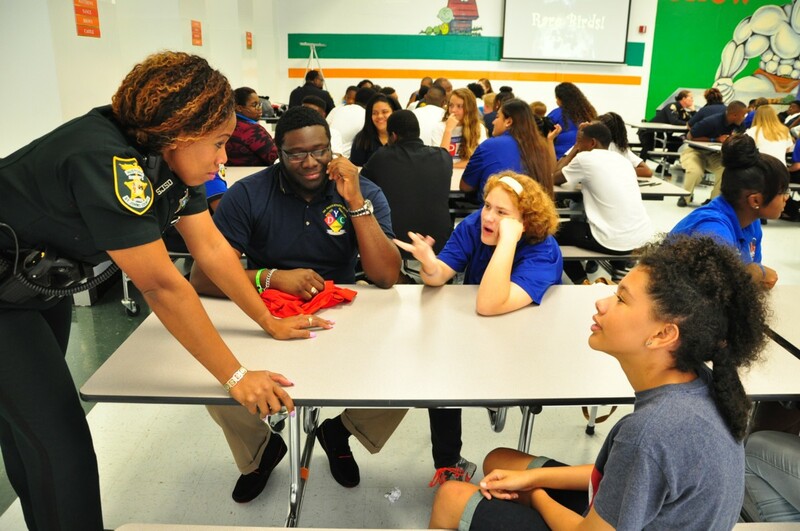 Police Officers joined in and shared their experiences with the youth. Javier directed the group through a couple of ice-breakers-Emoji Revolution, where the attendees mixed it up assuming lowly emoticon postures and then moving up to higher, more respected emoticon postures (never mind--you had to be there) by playing rock, paper, scissors. Then they formed into other groups for Thumb Wrestlemania, which took wrestling to an extraordinarily different and amusing level. By this time, strangers were laughing together, new friends were made, and new perspectives were forming. For the next getting-to-know-you activity, Rare Birds, Ty asked the groups to list things about themselves that weren't readily apparent to others at their table, such as awards they had received, or other things that showed their unique attributes. (For instance, did anyone know that Ty has some mean robot dance moves? He does; he demonstrated to the delight of the rally participants) When the lists were completed, the others in each of the groups attempted to match the lists to the correct persons. "You are rare-unique," Javier said. "You are the first 'you' in the universe. You are valuable. And so, what is your contribution? Try to leave this planet better than you found it. Everything you do or say either adds to or takes away from the lives of those around you. As humans, we can choose what we're going to do or say. You have a chance to contribute." The Ways of a Way-Maker. . .
knows that love is the greatest force. . . .or are you a wanter? Wanting, but not doing anything to get? . . .or a watcher? Watching cool things happening to others, but not doing anything to make things happen for yourself? . . .or a waiter? Waiting to be handed things? If you are a Way-Maker, starting from choices you make from this day on, you decide every day what kind of day you will have, and you . . . Put Your Passion into Practice. Ken Jefferson former JSO Officer and Action News Jax Crime and Safety expert. Speaking of someone who has put his passion into practice, meet Ken Jefferson, who drove down to St. Augustine for the rally. From the time Ken was a fifth-grader, he knew what his passion was: he wanted to be a police officer. He remembers the exact time he had this revelation: Officer Marvin Young came to speak to Ken's fifth grade class, and told the class they could defend people, make people feel safe. "That's what I"m going to do," young Ken thought. "I had no doubt that I was called to be a police officer. Before I became a police officer, I was in the corporate world, making lots of money, but when I got the opportunity to go into law enforcement, I went for it." For twenty-four years, from 1986 to 2010 when he retired, Ken worked for the Jacksonville Sheriff's Office as an officer, detective, academy instructor, and police recruiter. For five years, he was a police information officer. "I enjoyed my career; it didn't feel like a job." Beginning in October 2015, Ken joined Jacksonville television's Action News Jax, where he currently is employed as their crime and safety expert. As a fifth-grader, Ken did not feel safe. He saw arrests every day in his neighborhood. As Ken and his brothers walked home from school every day, they were challenged and attacked by a group of bullies, their classmates. "They would fight us, rob us, beat us," he said. "If I had fifteen cents, they took it. They wanted to rob my spirit. I used to have to hunt for my books after they had thrown them in the woods. My brothers and I could have stood up to those bullies, but then it would have been all-out war. We had to watch our backs just to go outside to play." At one time, Ken's family-parents, five brothers and one sister-- was homeless, living in their station wagon. At other times, the family lived in a two-bedroom apartment. Eventually, the family's economic picture improved, but during the hard times, Ken understood temptation. "That was a lot of stress on a kid; the temptation to steal from need is strong. But I made my mind up not to hang with the questionable people and to stay out of trouble," Ken told the rally participants. "Those bullies heard that same talk to our fifth grade class from Officer Martin Young as I did, but they chose a different path," Ken said. Ken has found out where those paths took the bullies. In 1986, on Ken's first day working at the jail, he saw one of those old bullies, being held there, making excuses, telling lies. The then-grown-up bully was released, but just a few days later, he was arrested for robbery and inflicting injury-two felonies-an's still in prison. Another of the bullies stole a gun, robbed a store, and the police, when called, stopped him with deadly force. Two of the other bullies are incarcerated, one for murder. One of the bullies is alive, not in trouble, but is walking around Jacksonville, homeless, having lost his mind on drugs. The last bully has a family, seems to be doing well-in fact, he apologized to Ken for his past actions, and Ken forgave him. However, before the conversation ended, he asked to borrow $5 from Ken. "Your future is bright if you don't mess it up," Ken told the PAL kids. "Don't let others influence you to go the wrong way. Don't let your beginning dictate your end." What Can a Jar of Skittles Tell Us About How Others Influence Our Decisions? Guess how many Skittles in the Jar! That was the task Ty presented to the group. Decide the answer individually, then with a partner, and then with the others at your table. Did the answers change? What influenced you? Was there group compromise? Who did you trust and from whom did you take advice? We need to be wise in choosing our advisors, but ultimately, we are responsible for our own decisions. "By yourself you can make a difference," Ty said. "Working together we can make changes. If you're determined to make a difference, then your attitude--your feelings toward something--is crucial. We spend a lot of time thinking about what's happened, but it's over. And you can't control what's happening in other places. What you have is right now-the present. If you want to make the most of your life, spend time thinking about the positive stuff." The small groups brainstormed issues they could impact in their communities. What do we need more of? What do we need less of? 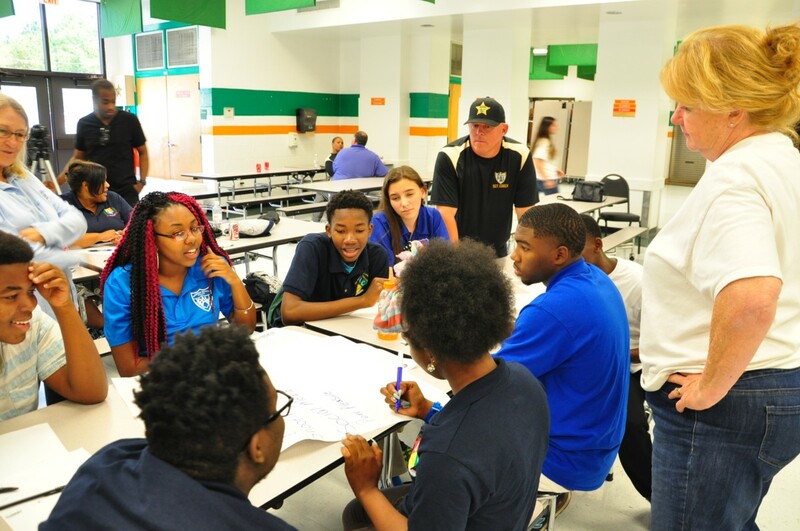 Javier and Ty challenged participants to decide what they "believe about positive choices and change, and why and how it can impact our world, country and community." In the final segment of the rally, the participants implemented their dramatic acting skills. 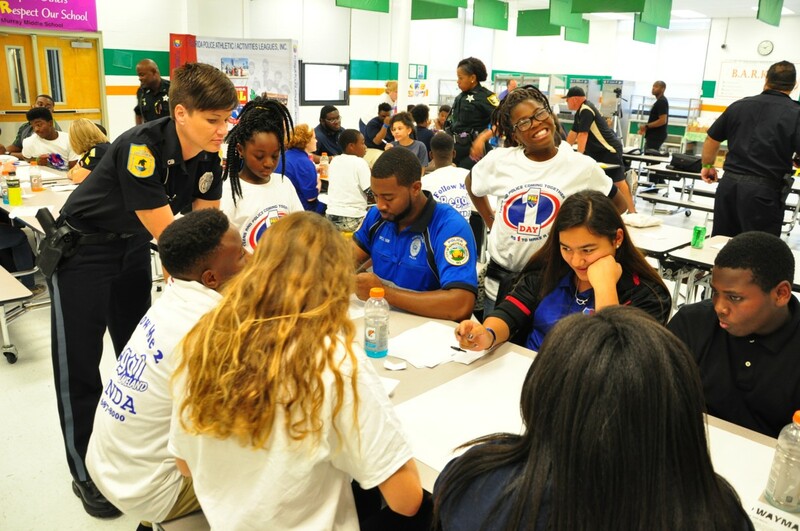 They planned and presented several different role-playing scenarios showing how officers and youth can work together safely and without violence-scenarios such as traffic stop encounters, loud party complaints, or suspected drug use confrontations. These situations don't have to end in disaster; the groups were asked to demonstrate a better way. The best outcome from the rally will be if participants come away with fresh perspectives on how youth and law enforcement can interact peacefully. If each has empathy and understanding for the other, rough seas can be navigated well. Keep calm, and sail on.